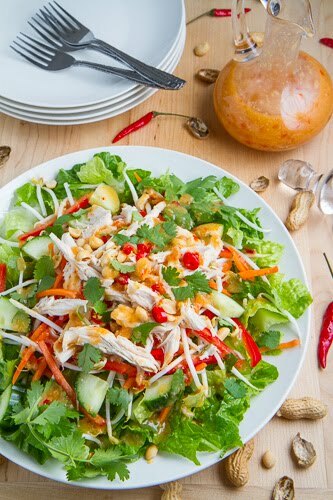 A fresh and tasty chicken salad in a Thai sweet chili sauce dressing. Armed with my shiny new sweet chili dressing it was time to use it and it only seemed natural to use it in a chicken salad since the idea came when I was enjoying a chicken satay salad in spicy peanut dressing . 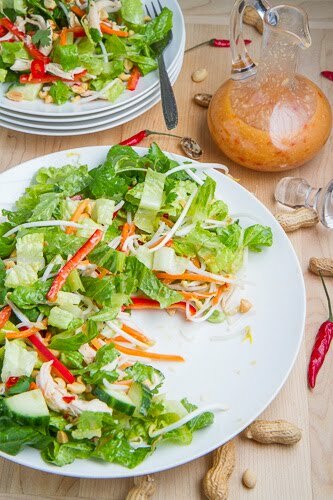 I decided to go with a lettuce base for this salad and then I filled it out with some ingredients that I commonly use in Thai style dishes including bean sprouts, carrots, red peppers and cucumbers. Next up is the chicken and to make things easy I used shredded chicken so you can use any leftover chicken that you may have. 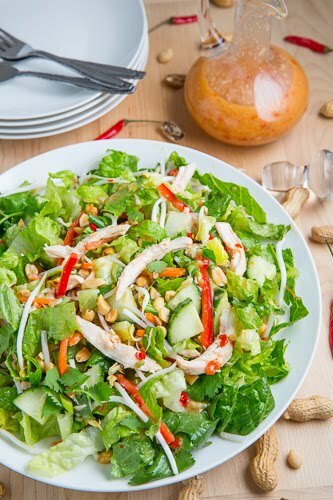 The salad is then garnished with chopped peanuts, sliced chilies and some fresh herbs including one or more of the following: cilantro, mint and Thai basil. I have to say that the resulting salad has to one of the best that I have had in a while! 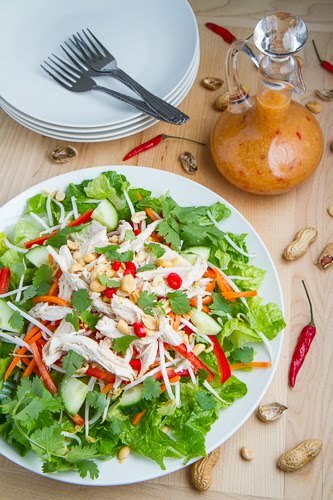 It is so fresh, juicy, crunchy and full of flavour provided by the amazing sweet chili dressing ! One thing that I noticed is that the dressing clings to the chicken nicely ensuring that the chicken in nice and moist and very tasty! 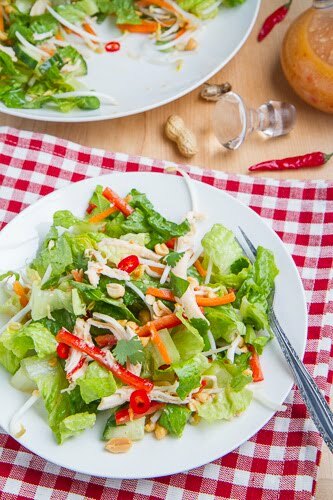 The salad may look better all neatly stacked but eventually it needs to be tossed! Then it can be served. Now I can finally eat! Note: I went with simple leftover chicken here but you could go with something a little more like marinating the chicken in some of the sweet chili dressing and then grilling, broiling or baking it before shredding it. I love the sound of this dressing. The combo of flavors here is right up my alley! I am having an Ontario Bloggers Day tomorrow on my post, if you would like to be linked up there, please shoot me off an email at justnorthofwiarton@live.ca would love to have you there ! I really like sweet chili sauce so I'm sure I will love your sweet chili dressing. This is a beautiful salad. Kevin, this salad looks delicious! Greetings from Romania – Europe! Looks really fresh and love the flavours going on. Turning leftovers into a salad is a great idea! And that dressing sounds addictive. It would even make a salad taste fun! Look wonderful! I love using leftovers for a healthy salad like this! The salad sounds so yummy. Very refreshing and healthy. And looks so colourful. Love loaded salads!! I feel like I'm actually eating a real meal instead of just some greens!! I have seen this all over pinterest and was drooling, and how nice that it belongs to you! I really want to make this! Question: What to substitute for the coconut milk. Huge Allergy! Looks absolutely delicious, as usual, Kevin! Wow, it that ever gorgeous! I LOVE everything you post, Kevin! Thanks for participating in Ontario Blogger Day; hope you find a moment to drop over there to visit everyone else who were also "linked" in. "Just Me"
YUM-OH!!! Came by for a visit via Cindy's Ontario Blogger Day. You have some fabulous dishes here – I'm supposed to be on a diet and I am DROOLING over all this stuff. Your Cheesy Broccoli Quinoa is making me swoon! Charlie: Almond milk might work, otherwise maybe just enough oil to get it to a dressing consistency. Love the look of this salad! Healthy and still tasty. Nice pics! I get bored with salads in the summer but this one looks like it’d keep me entertained for a while. The dressing looks amazing! I'm not the most talented when it comes to putting a salad together, so I'm always looking for help. This is hands down, the best salad I've ever made. The dressing really took it to another level! I'll be making this quite often now. Thanks so much for the wonderful recipe!! I made this salad and it was delicious. I thinned the dressing down with a bit of water and nuked it all in a pyrex cup. So easy!. Used leftover rotisserie chicken, and some shredded napa cabbage in place of the bean sprouts. I also topped it with those thin, fried rice noodles in addition to fresh Thai basil and mint from my garden. Wonderful and filling on a hot summer day. Anonymous: Glad you enjoyed it! The crunch from the fried rice noodles would be nice addition! Kevin–I made this for a Dinner Group–it was the hit of the evening! Leftovers made perfect lunches. This was one delicious dish! I would make it again this week but I need to try other recipes out that I have marked on your blog. I blogged about this recipe–giving you credit. Thanks again.